The 16-time champion jockey has been given the all-clear and should make his comeback this week after a month out of action. 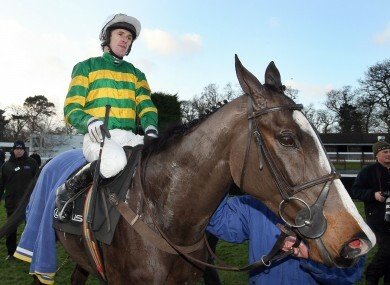 McCoy with Synchronised at the Leopardstown Festival last month. JOCKEY TONY MCCOY is hoping to be back in the saddle to race as soon as this Thursday after recovering from injury. The 37-year-old has been out of action since December 30 when a heavy fall at Taunton resulted in fractured ribs. And only last week, he spoke of the doubt he had over whether his body was ready to take the impact of another such incident in his Daily Telegraph column. However, a check-up with his specialist on Monday has clearly gone better than had been expected. An upbeat McCoy is now scheduled to team up with trainer Rebecca Curtis for two rides at Warwick on Thursday, and all going to plan, he will then feature in Saturday’s Cheltenham Festival trials day. ‘The doctor is very happy so I should be back on Thursday,” he said in The Daily Mail. Email “McCoy set for return at Warwick on Thursday”. Feedback on “McCoy set for return at Warwick on Thursday”.